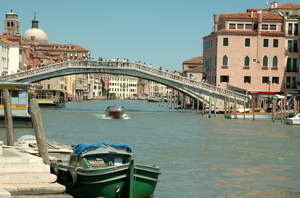 Venice bridges - you know Rialto bridge in Venice but what are the others? "Venice Bridges...the best way to see all of them in one go is by taking a vaporetto ride down the Grand Canal." Although there are about 450 Venice bridges in total, only 4 of them are on the Grand Canal itself. 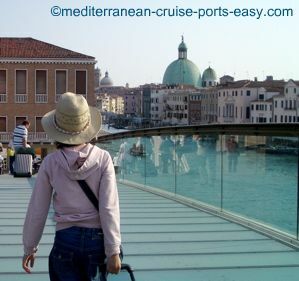 Together with the famous Bridge of Sighs, those are the Venice bridges that everyone has heard of and everyone rushes to see when visiting or cruising to Venice. a setting for some romance with that special someone. So, get lost away from the tourist paths and make sure you find one of the Venice bridges that you can call your own for a few minutes. 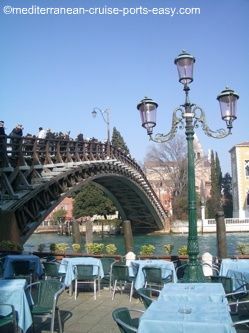 But after that, make sure you also see the Venice bridges over the Grand Canal. The best way to see all of them in one go is by taking a vaporetto ride down the Grand Canal. Accademia bridge or Ponte dell Accademia is the wooden bridge that you will see first when taking a vaporetto ride from Saint Mark’s square. It was built in 1932 as a temporary bridge until the proper bridge was built, but it became so popular with the Venetians, they decided to keep it. The original structure was replaced with an exact replica in 1986. Although there is always a steady flow of tourists across the bridge on their way to Accademia art museum, this bridge is a bit less hectic than the atmosphere on the Rialto Bridge. Start walking down the Sal S. Moise and Calle larga 22 Marzo and carry on walking for about 15 minutes following the signs to Accademia. You can’t miss it as there are always rivers of tourists flowing down the same route. Once on the bridge, fight for your position by the railing and enjoy. From there, you can also take some great shots of the La Salute Church in the distance and the Customs house at the point where Canal Grande turns into Canale di San Marco. The oldest of all Venice bridges on the Canal Grande, and the most famous bridge in Venice, is one of the top Venice attractions for Mediterranean cruisers. You can read more about Rialto bridge in Venice here. This is also a pretty recent bridge, built in 1934. It was designed by the same architect that designed the Accademia bridge but its appearance is very similar to that of the Rialto bridge, except for the shops and arcades on top. Its purpose was to provide a connection between the sestieri of Santa Croce and Cannaregio. The bridge was named after the Scalzi monks (barefoot), whose monastery and church are nearby. Before the Calatrava Bridge was built in 2007, this was the first bridge on the Venice Grand Canal coming from Piazzale Roma. Ponte della Costituzione, or Calatrava bridge on the Canal Grande, is the latest addition to Venice bridges on the Grand Canal. 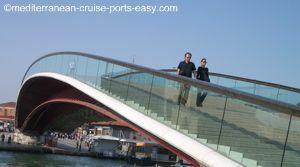 If you have decided to walk from the Venice cruise terminal to San Marco square ot take the Venice people mover, via Piazzale Roma, this is the first bridge you will encounter on the Grand Canal. You can either cross the bridge, go past the Santa Lucia train station and carry on walking towards Piazza di San Marco through the Cannaregio district… or stay on the right hand-side of the Grand Canal and reach the Rialto area through the district of Santa Croce. As the first bridge to be built in Venice in the past 70 years and the fourth bridge on the Grand Canal ever, Calatrava bridge was destined to ruffle a few feathers, as it has. The whole idea of building Calatrava bridge was started in 1999 and Spanish architect Santiago Calatrava was commisioned to build it. One of the first controversies that followed this bridge, still to this day, is the fact that some found there was really no need for it as Ponte degli Scalzi was just some hundred meters down the canal Grande. Second, this bridge was built in a modernist-minimalist style of steel, stone and glass which some thought didn’t fit the true character of Venice. Third, the bridge is currently not accessible for wheelchairs although some work is being done to fix the problem. In spite of all that, Calatrava bridge definitely is becoming one of the top Venice landmarks and must-see spots. We love the way it blends in with the existing architecture. At the same time it is an exciting sign that this place is not just a museum in which time has stopped, but a living and breathing city!